Dinosaur Egg Popsicles are a whole fruit treat made with pluots, a cross between a plum and an apricot, and one of the truly spectacular fruits of summer! Cut each pluot in half and then give them a rough chop. Add them to the bowl of a food processor along with the sugar and the lemon juice. Process until smooth, scraping down the sides of the machine if necessary. 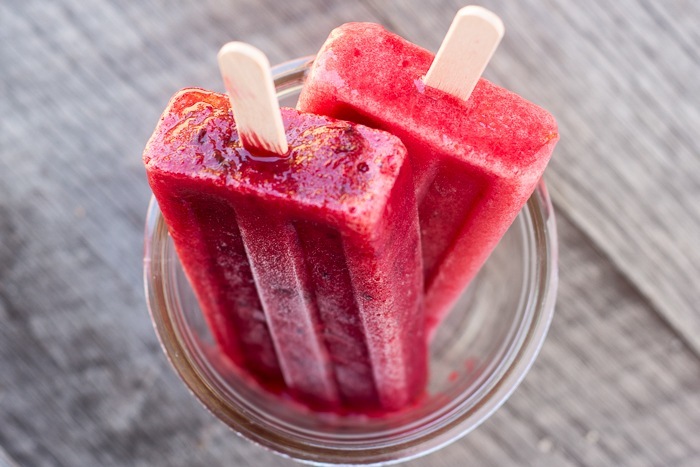 Transfer the puree to a measuring up with a spout and fill your popsicle molds. Insert sticks and freeze until solid. To remove, fill your sink with hot tap water and immerse the mold up to, but not over, the top lip for just a few second. If the popsicles are still stuck, immerse for a few more seconds. Store well wrapped in the freezer.